Today served as a timely reminder towards the end that not every day on my adventure has been comfortable; not every day has been enjoyable. Today’s been one to test my endurance. It was raining when I woke up, it was raining when I finished, and in between …. it’s been raining. Up to and beyond Portreath the path snaked precariously round windy cliff tops, across more old mine workings. This is becoming Poldark country, but it was too wet and windy to get my top off and my scythe out. Some of the drops to the sea were scary and the numerous warnings that the cliffs are, (in case I hadn’t noticed! ), dangerous, steep, crumbling, high, unstable etc didn’t exactly calm my nerves! My feet have been wet for the whole day and the paths seem to be stonier than usual. My right-foot small toes are screaming for me to stop. ‘Hell’s Mouth’ matched my mood. And seeing ‘Sally’s Bottom’ and ‘Ralph’s Cupboard’ barely raised a smile …. At Gwithian I kept on the road to reach Hayle, which seems sprawling and dull, though I missed the beach which I guess must be the town’s redeeming feature. 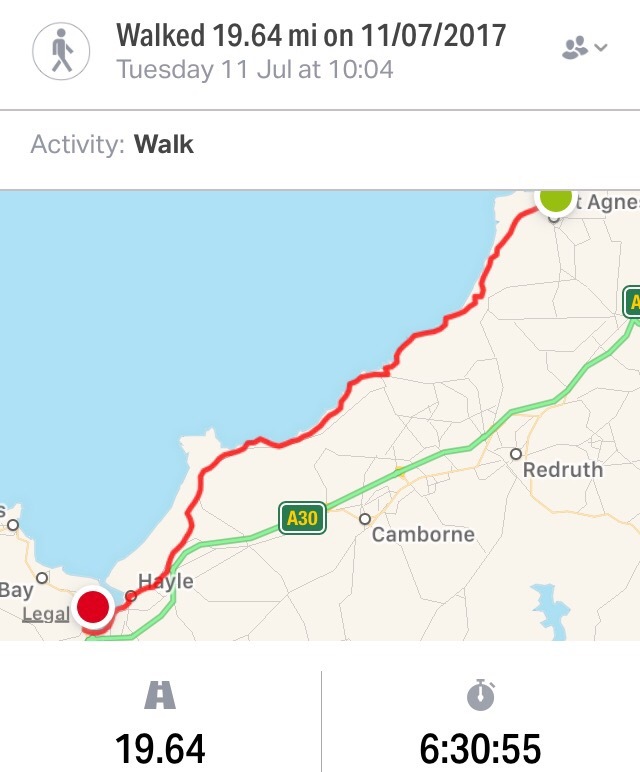 I wasn’t interested in redemption by then and trudged round the causeway to get past the salt marshes and onto the path into Carbis Bay and St Ives. Desperate measures this evening to get my boots dry. The good news is that the forecast for the next two days is good so I won’t need to carry a hairdryer any further…. The Badger pub is okay. I joined Carl and Adele, prison officers from Bolton, in the pub quiz. I was useless and we didn’t win. How could we not know the words to ABBA’s ‘Waterloo’ … ?! If it’s any consolation I firmly believe we grow by being out of our comfort zone. Chin up and stride out. Oh poor you. The weather really was atrocious yesterday. More “Mr Grumpy” than “Mr Happy” yesterday? Keep smiling and hobbling on your penultimate day. Those boots will not even be fit for gardening after tomorrow! You should be immensely proud of yourself , and take care in the boulder fields between St Ives and Pendeen . Oh dear, you do look cross. But if you stand on tiptoe, you might be able to see LE, so long as it stops raining and the mist clears. You only grow by challenging yourself and moving out of your comfort zone. I changed chairs yesterday and found that it was far easier to reach the biscuits. Keep going, hopefully the better weather will let you enjoy the last 2 days. Even if you can’t remember the Waterloo lyrics, you surely have The Proclaimers ‘I’m gonna be’ firmly implanted by now! Will done fella, bloody good effort. I’m just worried if you jettison the hairdryer how are you going to do your hair? Not long to go, mate! I shall miss your blog! This sounds like a v tough one but be proud of your resilience and let’s hope the sun shines, the boots dry and your toes stop shouting at you in the next couple of days. Great effort. Your toes sound like they are requesting much dryness and some nifty open toe sandals. It’s sunny in the South West today, So you should be able to grant the toes one of their wishes. Good luck on the final push. I am very proud of you! Glad you’re having a really s**t time while the rest of us are working.